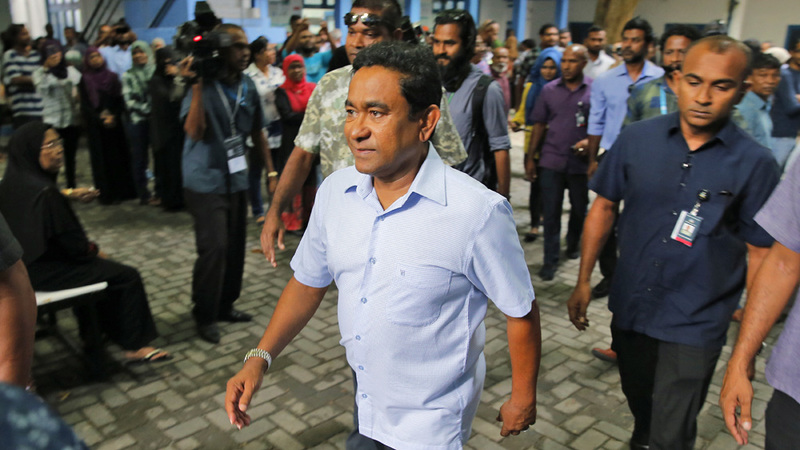 Voters in the Maldives delivered a stunning defeat for President Abdulla Yameen in a contentious presidential election on Sunday, an outcome regarded as a victory for democracy over authoritarianism in the Indian Ocean island nation. Officials and analysts say the president’s infrastructure achievements – which include the South Asian country’s first bridge, new airports and harbours, as well as dozens of resort openings – were not enough to quell public anger over allegations of graft and a wide-ranging crackdown on dissent. Yameen now joins a growing list of global leaders ousted this year amid public outrage over human rights abuses and corruption, including Malaysia’s Najib Razak and South Africa’s Jacob Zuma. “We thought people would vote for us, after they saw with their own eyes the development President Yameen brought to this country,” said Ahmed Nihan, leader of the ruling Progressive Party of the Maldives’ parliamentary group. Yameen – who lost by a margin of 16.7 percent to his challenger and opposition candidate, Ibrahim Mohamed Solih – presided over the Maldives’ biggest-ever corruption scandal, in which at least $79m was stolen from tourism revenues. The money, obtained from leasing islands for tourism, an industry which accounts for more than two-thirds of the country’s foreign earnings, was diverted to private accounts and embezzled, according to several audit reports, as well as a 2016 investigation by Al Jazeera. The cash was then used to bribe legislators, judges and government officials, Al Jazeera’s investigation found. Associates of the president, in secretly filmed interviews, said they carried money to the president in black bags. Yameen, however, denied any wrongdoing. Nihan, the ruling party politician, maintained the president’s innocence, and blamed former cabinet officials for the theft. Yameen, who came to power following a disputed election in 2013, brought order and stability to a country riven by years of unrest since prison riots led to a democratic uprising more than a decade ago, Nihan said. And the president prevailed in forcing through his development agenda, despite challenges to his rule “from all sides”, he added. Indeed, Yameen’s five-year rule has been tumultuous by any measure. He has jailed or forced into exile nearly all of his political rivals, arrested hundreds for protesting against his rule, suspended parliament for long periods of time, and shuttered independent and critical media. He claimed he was defusing attempts to topple a democratically elected government, but critics said the president was turning to autocratic behaviour to cover-up corruption. Those jailed during Yameen’s tenure include his own vice president, Ahmed Adeeb, two former presidents, including his half-brother 80-year-old Maumoon Abdul Gayoom, who ruled the Maldives for 30 years, and Mohamed Nasheed, the country’s first democratically elected leader. Two Supreme Court judges were also arrested during a state of emergency in February after the top court ordered the release of nine jailed dissidents. Faced with widespread criticism, Yameen pushed through a draconian law on defamation and imposed more than $250,000 in fines on opposition aligned Raajje TV for slander. He also pulled the Maldives out of the Commonwealth after threats of sanctions, and moved closer to China and Saudi Arabia over traditional allies, India and the United Kingdom. The crackdown united the four opposition political parties, who fielded a long-time member of parliament, Solih against Yameen. Solih promised to restore democracy, release dissidents and investigate corruption allegations against Yameen. In the run up to Sunday’s vote, Solih said he was worried it would be rigged, but said he was sure voters would turn out in large numbers to say “no” to Yameen. With so much hanging in the balance, why did the president contest an election that he could lose? Niyaz Ibrahim, a former auditor general who lost his job after he flagged corruption in tourism leases, said Yameen was “convinced he could win”. The president’s campaign, however, was carefully choreographed to avoid any public criticism. He avoided traditional electioneering such as door-to-door visits, and increased appearances at ribbon-cutting ceremonies for infrastructure projects, some of which were completed early on in his tenure, according to the Maldives Independent news website. In some islands, the opposition’s campaign banners were taken down and activists arrested in preparation for the president’s visit. “He brought unprecedented developments in infrastructure, but he also took away basic rights, jailed whomever he wanted, brought the courts under his control, and enriched his cronies. Latheef said he believed Yameen would have overturned the election if the outcome were not in his favour, but the huge margin for the opposition made that task impossible. He pointed to the president’s frequent warnings against accepting bribes for votes in the run-up to the election, as well as a police raid on the opposition’s campaign headquarters on the eve of the vote. Nihan, the ruling party politician, however dismissed the allegations. The opposition’s win on Sunday was proof the corruption allegations were “baseless”, he said. “There was so much lies and slander during this campaign. But we didn’t take action because we thought we would win. Maybe we should have,” he said.